I have always wondered why the most picturesque places lay forgotten during so called “off season” while is overflowing with tourists during “on season”. When these amazing places welcome everyone – healthy or weak, young or old, boy or girl – with equal unbiased charm, why do we choose to bias our visits on “on seasons” and “off seasons”.This story is about the beautiful hills of Kakkabe which is situated in Karnataka’s western ghats. Every year, February to April is the time when Bangaloreans run out of options for weekend getaways to escape the scorching sun in the city. This time around I and my friends found ourselves in same fix but as usual , the travel bug bit me! I wanted to explore an offbeat place this time and irrespective of the weather there, I decided on Kakkabe which is at a drive of 270 kms from Bangalore. We packed our bags and set off for our journey to Kakkabe hills at around 5 am. Thanks to the Karnataka highways and roads, it was an extremely smooth ride and as if almost consciously making an effort for the same unbiased welcome, we experienced the fog and mist which suddenly enveloped the roads on our way. We were thrilled by the soothing weather, as unexpected as it was! Being an art lover, I was quite amused to see these artwork on private local buses that overtook us. . All these experiences filled me with energy to soak in everything which came my way. The nature has it’s way of sympathizing with us by being its best even when it has to face the heat of the scorching sun to give us some relief. The long branches of the trees had covered the entire width of the road so that the travelers can take a pleasant break and relax for a while. The road trip always lead you into life musings that otherwise we are too busy to ponder. The symmetry in nature, the horse rider who is riding the horse not to impress anyone and the giant wheel longing for some children to embrace it with their laughter drew my attention to not so noticeable things of life. Just as we entered Coorg, we received a phone call from the owner of the homestay (which we had booked) inquiring about our time of arrival. During the call, he mentioned a monsatery which was a little detour from the way to the homestay. 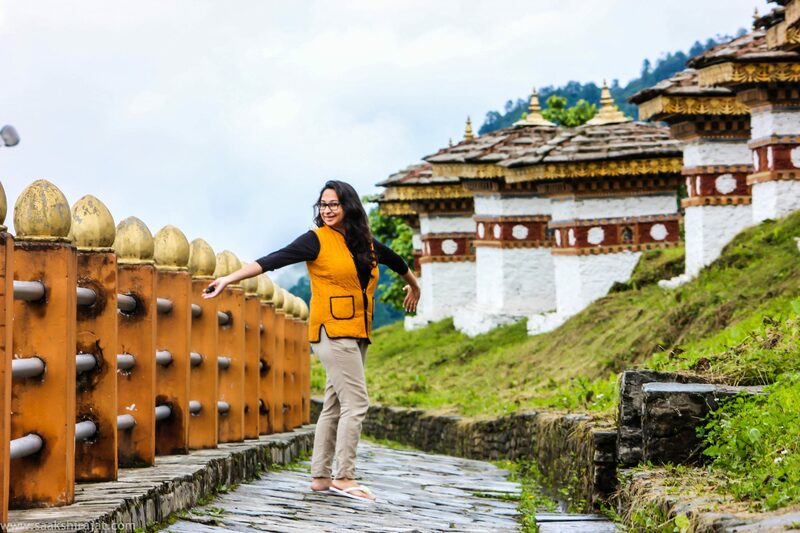 My love for monasteries makes me visit each and every monastery I come across and immediately we planned to visit that beautiful Namdroling monastery popularly known as Golden Temple. It is situated in the town of Bylakuppe near Coorg which is home to many Tibetan settlements. The monastery houses three big golden statutes of Gautam Buddha, Padmasambhava and Amitayus which form the main part of the temple. It is always peaceful to visit monasteries and spend sometime to just observe the monks and their activities. In one corner, the younger monks were busy playing the traditional Indian game called Seven stones, and the other corner had some young monks sitting in front of the porch of the monastery dangling their legs and observing the visitors. After appreciating the monastery for a while, we planned to start our drive again to the resort as the sweltering sun had already drained us out and we wanted to take some rest before setting out to visit next place. The car rushed through the hills and we were at the Palace Estate Resort in 2 hours. The trees around the hills were covered with dust and mud and had turned brown. It looked as if the trees were feeling love deprived and were desperate to turn green after the rains wash the dust and mud off them. Rain gods, please oblige the trees soon! Another sight, I being a coffee lover, totally adored was fully blossomed white coffee flowers. These white flowers were spreading some peace to the green turned brown trees. It looked like the white flowers were trying to soothe the brown leaves and giving them a ray of hope. Palace Estate Resort which I would call a vintage property had huts in the ancient times and is now renovated by the 6th generation of the owners to suit their needs and is given a modern look. The resort is located at the foot of the highest peak of coorg, “Thadiyandamol”. It is a huge resort which has around 8 rooms including a few at 1st floor as well. The owner, Mr. Prasad has maintained the resort very well and the rooms are done up beautifully to give them a tree house look. The resort is surrounded by forest and has a private waterfall. I kept wondering when Mr. Prasad mentioned a private waterfall, but to my surprise, it is actually a private waterfall which is accessible only through Palace estate resort. The food served had a lot of variety with the speciality of Avalakki roti (roti made of rice) to be relished with the mixture of home made honey and ghee which charged my taste buds immensely. I had the absolute pleasure to pluck fruits from trees and eat those fresh right away. There were so many fruits grown organically in-house like guava, berries, banana, papaya and probably a few more which I would have missed spotting. That’s what you call eating organic! 😀 But yeah, being so good in every aspect, the resort let me down big time when it came to serving coffee. When there are coffee plantations all around, the expectation of having a good coffee goes a notch higher but to my disappointment, the resort did not serve a good coffee. Another place to see in Kakkabe around 3 kms from our resort was Nalknad Palace which is around 300 years old. The forgotten palace is the last refuge of Chikka Veerarajendra, the last king of Coorg. It is a very old house standing in the middle of forest. What caught my eye was intricate wood work, wall murals, ancient marvellous paintings and achitecture. I believe places like these which have such grand architecture and historical importance should be given more care and maintenance than how I saw this time. On our way back we visited Talkaveri (in Kodagu district of Karnataka) which is considered to be the place of origin of river Kaveri. A kund full of kaveri water is a highlight that is sourced by a nearby spot which springs water. The water then flows underground and at some distance emerges as river kaveri. The spot is marked by a small temple where a lot of pilgrims pay their respect . The other arena of the temple houses statues of other deities as well. The temple is atop the hill which gives a breathtaking panoramic view of hills around. It was such an introspective feeling on this trip when I not only appreciated the nature as is but was again exposed to the fact that nothing is perfect in this world and nothing stays forever. I was left spellbound at the creation of God which keeps all of us (including nature) grounded! I would love to hear what nature is to you and would you embrace nature when it is not at its best? Seems like a nice place for a quick get-away! Definitely Rajiv, it was quite a relaxing time for me!